Father's Day is coming up in less than 3 weeks! Usually I let the kids figure out which presents they want to give their dad for Father's Day (hey, Alfie's their dad, not mine), but this year I've got a little extra surprise for him -- a CROSS ballpoint stylus pen. And not just any CROSS pen -- a CROSS Iron Man pen! 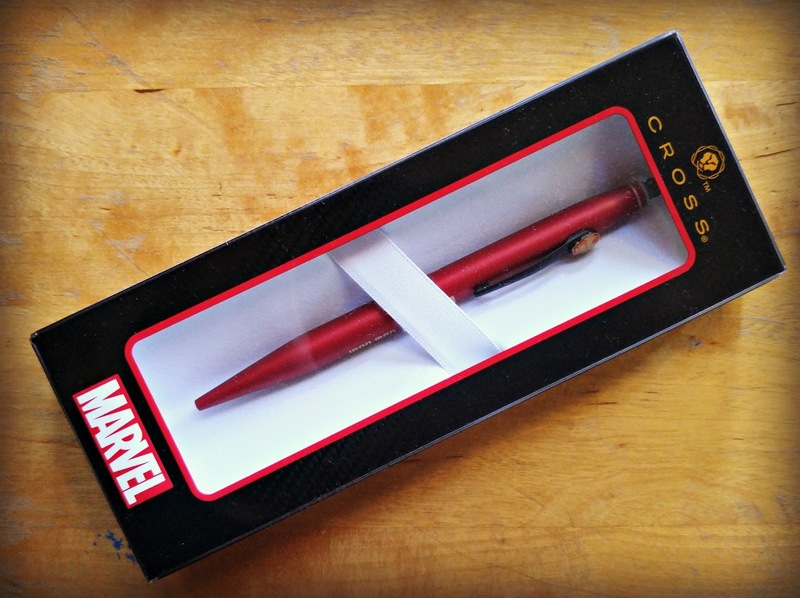 CROSS has launched a new series of fine writing instruments featuring Captain America, Iron Man and Spider Man. Since Father’s Day is approaching, we feel there is no better time than to honor the dads in the family, the real life Superheros. How super is that? 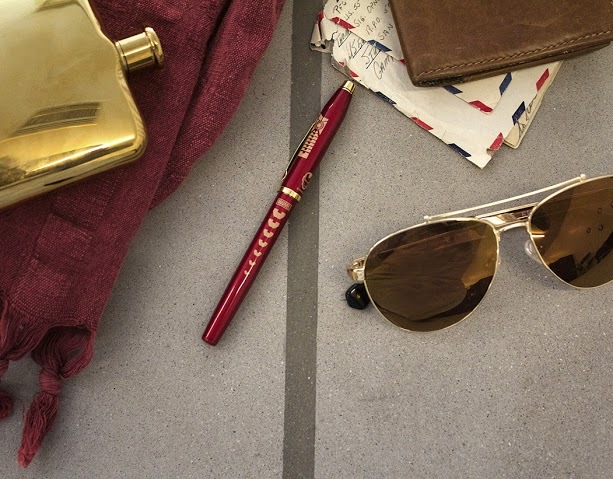 Alfie loves the elegance and quality of CROSS pens, so this is the perfect Father's Day present for him. CROSS's new Marvel pens come in 2 styles: the roller ball Century 2 series ($45), and the ballpoint/stylus Tech2 series ($45). Each series has 3 available characters: Iron Man, Captain America, and Spider Man. 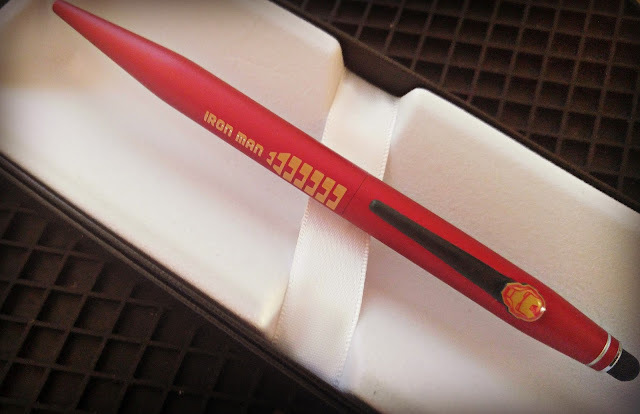 CROSS sent me my choice of Tech2 pens, so I chose Iron Man since I'm #TeamIronMan all the way. Here's a closer look at the pen. I'm not the biggest fan of Iron Man's color scheme (red and gold), but CROSS manages to make it look stylish and classy. The brushed metal is not too shiny, and the character logos are discreet (but not so discreet that fellow Marvel fans won't notice!). The pen writes like all CROSS pens -- smooth and easy, without any skipping or blotting. The stylus tip at the opposite end is perfect for writing and drawing on tablets. This also makes a great graduation present for incoming college freshmen and graduating college seniors about to enter the workplace. Having a CROSS pen is one of those coming-of-age things that everyone should have, along with a good suit, dress watch, and leather purse or briefcase. Thanks to the Marvel branding, it comes across as a hip and edgy present instead of an old and stuffy one. ROSS has always championed the pursuit of greatness. From the spark that inspires a passion, to the hard work and creativity needed to make it happen. It takes courage and a lot of heart, but those who take this path are the ones who make their mark on this world. CROSS was established in 1846 and to this day, receiving a CROSS fine writing instrument is a symbol of achievement, accomplishments, and human potential, all while being a luxury fine writing instrument. CROSS seeks to provide those possessing extraordinary vision and a strong entrepreneurial spirit with the tools needed to make their mark. CROSS will always continue to be the #WriteGift for recognizing the deserving moments in anyone's life from a job promotion, to marriage, to graduation… Who is deserving in your life? The pens are available in two styles. First the brand’s evolutionary Century II series finished in a high-gloss lacquer and includes a collectible, character-specific romance card (MSRP $150 USD.) 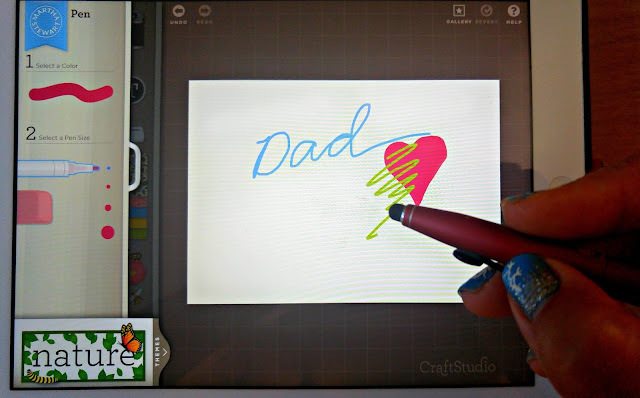 And the second is the Tech2 series, which transforms from a ballpoint pen to a stylus in a flash (MSRP $45 USD.) Both styles endow users with the “superpower” of expression via a fine writing instrument. Disclosure: This is a compensated post. Product information (in italics) was provided by Cross Writing Instruments via Xomad. The views and opinions expressed here are my own.